Photo courtesy of Herb Grosch. CLICK HERE for a full-size image. 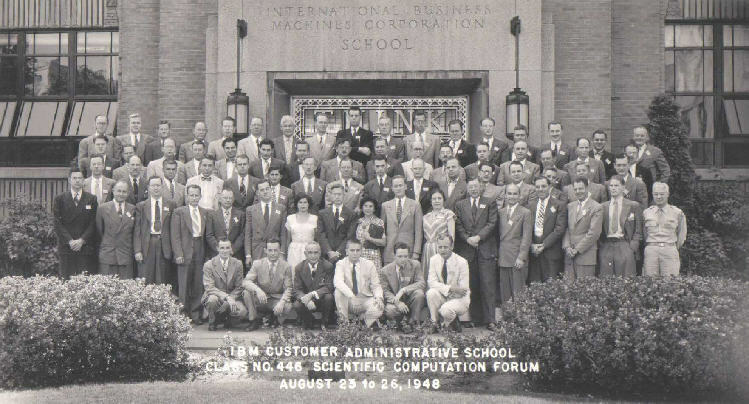 The IBM Scientific Computation Forums held in 1940, 1946, 1947, 1948, 1949, plus another three in the 1950s, were devoted to discussion of methods for solving scientific problems using IBM punched card equipment. The people who attended these gatherings pushed IBM machines far beyond their intended simple business and tabulating functions, largely due to the press of war, which required massive amounts of computation related to ordnance (trajectory, blast), navigation (lunar and stellar tables), aerodynamics, simulation, and other areas requiring application of higher mathematics, not to mention automatic sequencing and decision making to allow long, complex calculations to run to completion without manual intervention. From this work, modern computing was born. 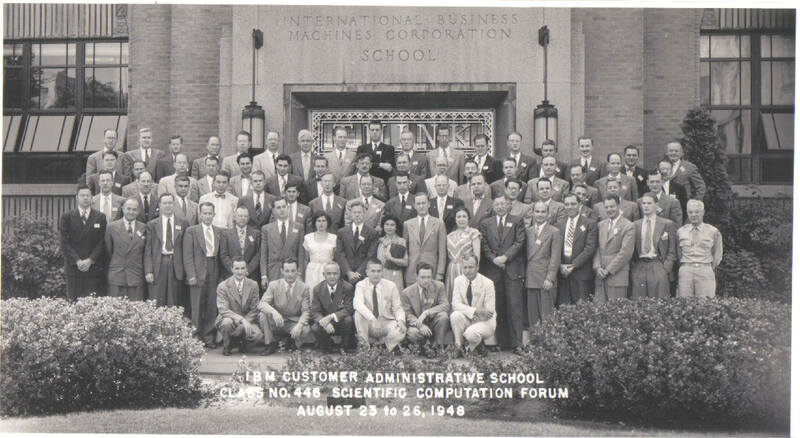 A complete list of attendees of the 1948 IBM Scientific Computation Forum follows. About half of them are identified in the photo; the notation [2,7] means second row from the front, seventh from left. Milton Abramowitz (Mathematician, US National Bureau of Standards); Thomas B. Andrews Jr. (Aeronautical Research Scientist, Langley Air Force Base); T.G. Andrews (Scientific Advisor, General Staff, Department of the Army); Kenneth J. Arnold [3,1] (Asst Prof Mathematics, U of Wisconsin); Walter Arnoldi (Project Engineer, United Aircraft); Edward W. Bentley (Statistician, Union Carbide); William D. Bell [4.7] (VP, Telecomputing Corp); Jack Belzer [4,14] (Ohio State U); Paul E. Bisch (Engineer, North American Aviation); W.R. Blakely (Beech Aircraft); Gertrude Blanch [2,9] (Mathematician, National Bureau of Standards); John R. Bowman (Mellon Institute); C.C. Bramble [2.5] (US Navy Proving Ground, Dahlgren VA); Stuart R. Brinkley Jr. (Physical Chemist, US Bureau of Mines); S.H. Caldwell (Prof of EE, MIT); B.F. Cheydleur (US Naval Ordnance Laboratory, Washington DC); George R. Costello (National Advisory Council for Aeronautics); S.W. Dunwell [5,5] (IBM); Wallace J. Eckert [2,8] (Director of IBM's Department of Pure Science, Director of the Watson Scientific Computation Laboratory at Columbia University; and Professor of Astronomy at Columbia University); A. Ross Eckler (Deputy Director, US Bureau of the Census); George S. Fenn [4,6] (Research Engineer, Northrop Aircraft Inc); Ben Ferber (Research Engineer, Consolidated Vultee Aircraft Corp); Walter Frantz [2,1] (Engineer, Boeing Aircraft); James Gean (Parsons Corp Aircraft Division); Herbert R.J. Grosch [4,11] (Senior Staff Member, Watson Scientific Research Laboratory, Columbia University); Preston C. Hammer (Los Alamos Scientific Laboratory); E.J. Hardgrave Jr. (Research Engineer, Ordnance Aerophysics Laboratory); H.H. Harman (Office of the Adjutant General, US Army); Paul Herget [5,6] (Director, University of Cincinnati Observatory); Frederick H. Hollander [5,13] (Nautical Almanac Office, US Naval Observatory); Ralph Hopkins (IBM); Cuthbert C. Hurd [4,13] (Technical Research Head, Mathematical Statistics and Automatic Computing, Carbide & Carbon Chemicals Corp); A.A. Jakkula (Executive Directory, Texas A&M Research Foundation); John Johnston (Los Alamos Scientific Laboratory); Gilbert W. King [3.4] (Physical Chemist, Arthur D. Little Inc.); John Kintar (Research Engineer, Beech Aircraft); Granino Korn (Asst Head, Research Section, Curtiss-Wright Corp.); Hans Kraft [2,3] (Aerodynamicist, GE); C.W. Kroll (US Army Map Service); Lt. Col. Joseph Kusner [1,17] (Munitions Board, Office of the Secretary of Defense); Joseph H. Levin (Aberdeen Proving Ground); Leonard Ligon (Parsons Corp); N. Arne Lindberger [2,16] (Fellow, Sweden Royal Institute of Technology); H.P. Luhn [3,8] (Senior Engineer, IBM); Charles E. Mack Jr. (Chief of Research, Grumman Aircraft); Frank J. Maginnis (GE); H.W. Marsh (US Navy Underwater Sound Laboratory); C.F. Maylott (Research Engineer, Bendix Aviation); Walter J. McNamara [5,1] (IBM); Reeves Morrison (United Aircraft); Francis J. Murray [not in photo] (Prof of Mathematics, Columbia University); Franklin G. Myers (Glenn Martin Co); Harry Polachek (Mathematician, US Naval Ordnance Laboratory); William H. Reid [1,6] (IBM); Ida Rhodes [2,11] (Mathematician, US Bureau of Standards); Leonard D. Rinaldi (Mathematician, Cornell Aeronautical Laboratory); Lydia G. Savedoff [2,7] (Cryogenic Laboratory, Ohio State University; Columbia University MA 1944 and PhD 1948); E.C. Schroedel [1,3] (IBM); Oscar T. Schultz (Mathematician, Sperry Gyroscope Co); R.R. Seeber Jr. [not in photo] (Senior Staff Member, Dept of Pure Science, IBM); Harner Selvidge (Bendix Aviation); Lansing G. Simmons (Chief Mathematician, US Coast & Geodetic Survey); Leland W. Sprinkle (US Naval Ordnance Laboratory)*; J.P. Stanley (Computation Centre, University of Toronto); C.H. Stevenson (Douglas Aircraft); L.H. Thomas [5,14] (Senior Staff Member, Watson Scientific Computing Laboratory at Columbia University); Oscar N. Thompson (Engineer, Consolidated Vultee); Harley E. Tillitt (Mathematician, US Naval Ordnance Testing Station); Ledyard Tucker (Education Testing Service); John W. Tukey [5,12] (Bell Labs and Prof of Mathematics, Princeton U); Frank M. Verzuh [1,15] (EE Dept, MIT); J.V. Williams Jr. (Engineer, IBM). Thanks to Herb Grosch for the photo, the page scans, and the identifications (August 2003). Seeber and Murray are not in the photo; they attended only the part of the forum that was held at the SSEC at IBM headquarters in NYC. My colleague Paul Malmström has composed the performed the first ever original tune for the organ, and I'm writing an article about the organ and its history. I found your photo and Mr. Sprinkle was identified by Luray's John Shaffer. Also see: Grosch, Herbert R.J., Computer, Bit Slices from a Life, esp. Chapters 11 and 12.